This useful resource is available for all to use. If you have an NHS learnpro account please access this through learnpro so that your health board is aware that you have completed this. This work complements existing national agendas and current training delivery. 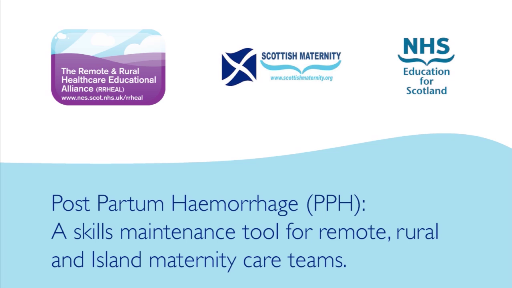 The PPH educational aid is intended as a skills maintenance tool and may be used for self led learning, as a basis for small group teaching or to support clinical review and debrief role modelling best practice within a rural setting. To provide a re-usable educational resource for maternity care teams in remote, rural and island settings, augmenting existing training and consolidating understanding of early interventions required in management of PPH. RRHEAL "Remote and Rural Healthcare Educational Alliance"